Justin Trudeau spoke to students at a high school in Sudbury, Ont. on Friday, but, according to a Catholic group, God sent a winter storm to keep the turnout low. Campaign Life Catholics, a division of the anti-abortion organization Campaign Life Coalition, issued a press release after Trudeau's appearance, crediting the almighty with lowering attendance for the event. "Faithful Catholics in Sudbury are thanking God today for having blocked pro-abortion extremist, Justin Trudeau, from being able to influence the hearts and minds of many children at St. Charles College High School," the release said. The bad weather prompted bus cancellations, which kept many students away from school. The school board had anticipated the full student population of 1,000 to attend, but only about 100 actually made it. "God is good. He spared 900 Catholic youth from being potentially influenced by Justin’s immoral views in support of abortion and homosexual marriage", said Kevin Murphy, who participated in a protest of the appearance, organized by Campaign Life Coalition, outside the school board office. Campaign Life Catholics wasn't alone in crediting God for the storm; Sun News got in on the action as well. On Twitter, Sun Host Michael Coren posted the following: "Storm prevented Heretic Trudeau from speaking to RC students in Sudbury. Wonder whose side God was on. What do we learn from this Bishop?" The bishop referenced in the tweet is Jean Louis Plouffe, who released a statement in support of Trudeau's appearance earlier this week after one board trustee spoke out against it. That trustee later retracted her statements. Plouffe wrote that the visit could be an "inspiration" for the students and that Trudeau had agreed not to speak about issues that might "contradict official Catholic teaching on life ethics." Coren later tweeted that he had been joking about God sending the storm: "If you want proof that atheists have no sense of humour look at how they treated my 'God brings storm to silence Trudeau' tweet. What fun." This isn't the first time Trudeau's Catholicism has been questioned in the context of a school visit. Last year, Tory Minister Dean Del Mastro took to Facebook to question Trudeau's faith after he was invited to speak at a Catholic school. At the time, Trudeau said he didn't see any contradiction between believing in rights for gays and lesbians and being Catholic. He also stated that while he is personally against abortion, he does not believe anyone has the right to tell a woman what to do with her own body. Del Mastro stood by his comments. 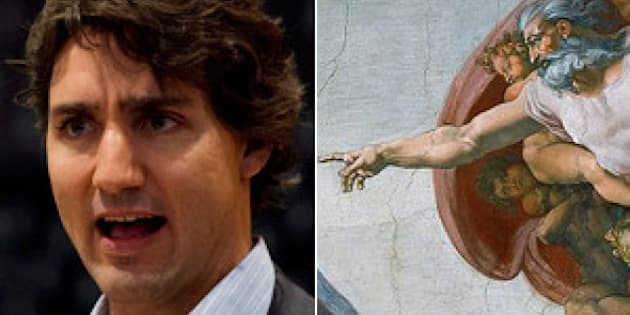 Trudeau has said he was raised Catholic by his father, former Liberal prime minister Pierre Trudeau, and regularly said prayers and attended church while growing up.